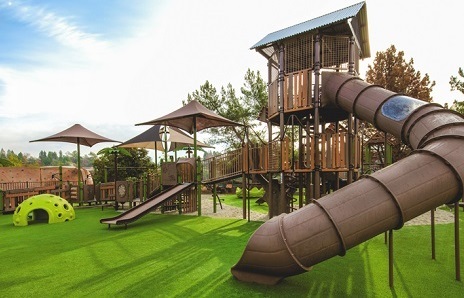 Artificial turf is an excellent choice for a safe, low maintenance playground surface. 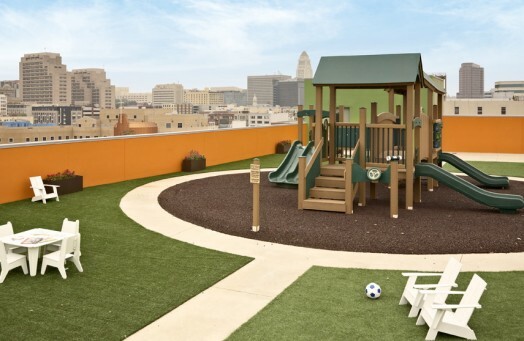 PolyTurf playground grass is non allergenic, does not harbor bacteria, and is lead-free, non-toxic, and recyclable. 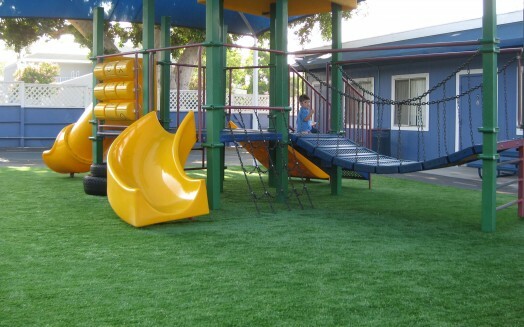 When used for playground surfacing, PolyTurf synthetic grass is often installed on top of a rubber safety layer for added fall height protection. PolyTurf playground turf features a natural, full thatch zone and does not require rubber or sand infill, although sand infill is often recommended for high use areas such as playgrounds and recreational fields for additional weight and cushion. The resilient blade fibers of the turf are made with Nanobac anti-bacterial technology to inhibit the accumulation of mold, fungi, and bacteria. For high impact recreational areas, PolyTurf Champion Sport is highly recommended. Champion Sport is specifically designed to provide optimal durability and tensile strength for playground turf and recreational areas. The short yarn height of this synthetic grass makes it stand up straighter and easier to keep clean. PolyTurf's Champion Sport synthetic grass is made with Cool Reflect heat reducing technology for a cooler, safer, more comfortable playing surface. Cool Reflect reduces the absorption and emittance of radiant heat by 20 degrees compared to standard synthetic turf. Thermal comfort is a critical benefit to children's well-being, especially in hot and arid regions with high heat factors like the Western U.S., desert climates, and inland areas. Lower temperatures on the field and on the playground result in a safer environment, more time for play, and lessens the likelihood of injury and burns. 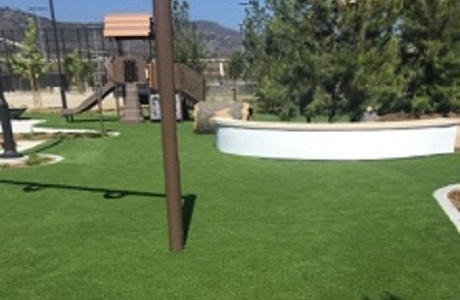 Additional PolyTurf artificial grass products we recommend for playgrounds include Active Pet & Play, Royal Deluxe, and Garden Grass for their durability, short yarn height, and tensile strength. Please visit our PolyTurf synthetic grass pages to learn more about each product. PolyTurf is often combined with PolyStar poured in place playground safety surfacing. 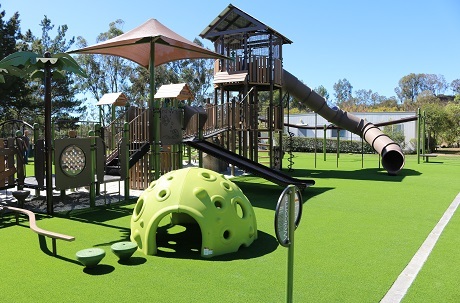 The synthetic turf can be installed around the rubber playground surface to beautify the surroundings and provide an additional recreational area. 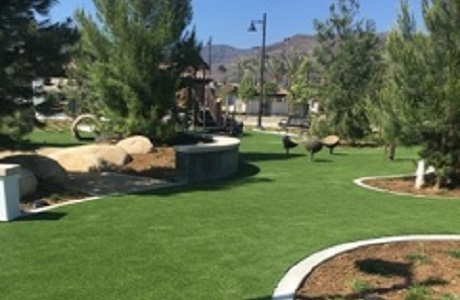 Additionally, PolyStar poured in place playground surface nearing the end of its useful life can easily be re-topped with synthetic turf to give the surface a second life while still maintaining ASTM requirements and fall height protection. 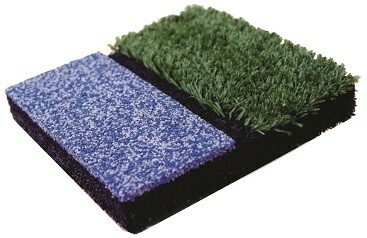 PolyFoam safety panels are a high quality, environmentally friendly, shock absorbing pervious pad for use beneath synthetic turf systems when an extra safety layer is needed. The highly porous design of PolyFoam playground pad underneath synthetic turf enhances field drainage both vertically and laterally and does not absorb water so it is ready for play shortly after rain stops. 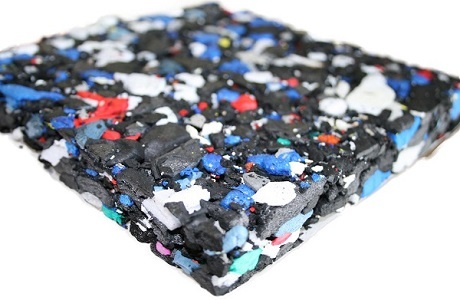 The PolyFoam pad is made from 99% recycled, non-contaminated post industrial cross link closed cell polyethylene foam and is 100% recyclable. This product also provides consistent 1292-04 Hic and GMAX ratings.